1 of 4 Spray slow-cooker bowl with nonstick cooking spray. Place ribs in bottom of slow cooker. 2 of 4 Scatter onion and garlic over ribs. Combine ketchup, broth, sugar, vinegar, Worcestershire sauce, mustard and black pepper. Pour over ribs. Cover and cook on LOW for 10 hours. 3 of 4 Remove ribs from slow cooker. Skim fat from sauce (there will be more than 1 cup). 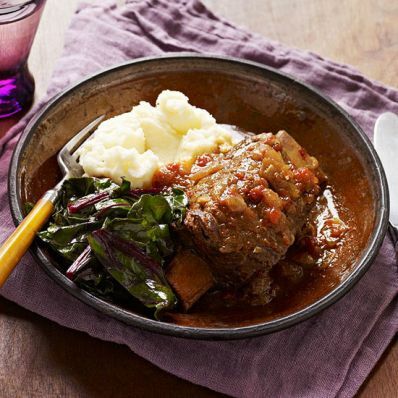 4 of 4 Serve ribs with sauce and, if desired, mashed potatoes and sauteed Swiss chard.